Generally low in fat, virtually free of saturated fats and contain no cholesterol. Soybeans and peanuts are the exception, with significant levels of mostly monounsaturated and polyunsaturated fatty acids, including alpha-linolenic acid. A good source of B-group vitamins (especially folate), iron, zinc, calcium and magnesium. Abundant in fibre, including both insoluble and soluble fibre, plus resistant starch for colonic health benefits. Contain phytonutrients (e.g. isoflavones, lignans, protease inhibitors). Soy beans are particularly high in phytoestrogens, with research over the last 20 years linking soy foods and/or phytoestrogens to a reduced risk of certain cancers including breast and prostate cancer, heart disease, osteoporosis and problems associated with menopause. 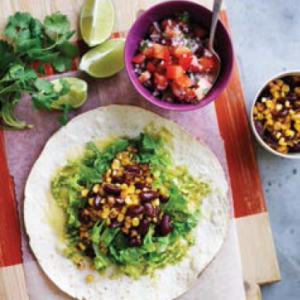 Gluten free – as such, legumes are suitable for people with coeliac disease or gluten sensitivity. Legumes contain relatively low quantities of the essential amino acid methionine (which is found in higher amounts in grains). 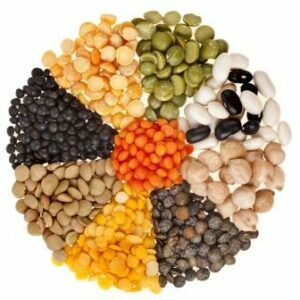 Grains, on the other hand, contain relatively low quantities of the essential amino acid lysine, which legumes contain. This is why some vegetarian cultures – in order to get a good balance of amino acids needed for growth and repair – combine their diet of legumes with cereal grains. Common examples of such combinations are dhal with rice in India, beans with corn tortillas in Mexico, tofu with rice in Asia and peanut butter with bread in the USA and Australia. A secondary analysis of The Australian 2011-2012 National Nutrition and Physical Activity Survey (NNPAS) conducted by GLNC has found that Australians who eat legumes at least two times a week have higher intakes of essential nutrients. However, many Australians just don’t eat them often enough to benefit from the fibre and plethora of nutrients available in most legumes. The NNPAS survey was based on a sample of over 9,000 adults who undertook a 24-hour dietary recall on the day prior to the survey. GLNC analysed the data to determine the difference between people who ate at least two serves of legumes a week and those that did not. The results of this survey helped us to understand the amounts of legumes that the average Australian eats and the importance of legumes as part of a balanced diet. Compared with non-consumers, those respondents who eat legumes regularly reported greater average total daily intakes of dietary fibre: 21.9g vs 30.4g respectively. 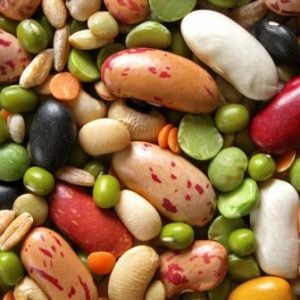 Respondents who regularly consumed legumes also had increased intakes of protein, iron, magnesium, zinc, iodine and folate compared with non-consumers. A table comparing the nutrient content of different types of legumes can be downloaded here. Citation: Grains & Legumes Nutrition Council (GLNC). Secondary Analysis of the National Nutrition and Physical Activity Survey 2011-2012 Unpublished: 2015.